Starting Wednesday students using the SHSU student health center will find a healthier, more serviceable health center, after an 8-month renovation and remodeling. The student health center at Sam Houston State University will be closed for two days Monday and Tuesday next week, but open again Wednesday in a newly remodeled, state-of-the art building at Ave. J and Bearkat Blvd. For the past eight months the health center has been temporarily located in modular buildings in the Estill Hall parking lot, providing their full range of services in a smaller working area. The remodeled building is closer to students walking from the main parts of campus and will have visitor parking spaces. "The students visiting the student health center have been very patient and accommodating and we know that when they see the updated building, they will know it was worth the wait," said Keith Lott, health center director. The health center will now be equipped with a modern heating, ventilation and air conditioning system. Students will have the opportunity to connect to high-speed wireless Internet while they wait for their appointments. The patient waiting room will be equipped with new furniture and a video monitor screen. 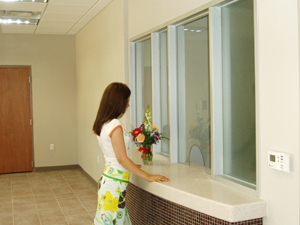 The front office and nurses’ station have been streamlined to make healthcare operations more efficient and the flow of traffic smoother. Students will now be seen in warm and soothing examination rooms with new furniture. Plus, there are two extra examination rooms to allow for the addition of a new practitioner and additional office space to resume the peer education program. "Students can expect the same high level of care but in a much nicer atmosphere," said Lott. "The student health center staff is excited about the move and the opportunity to further improve service for students." Services offered by the health center include primary care visits to practitioners, immunizations, laboratory tests, and pharmacy services. For questions about the health center or its services, call 936.294.1805.